Biochemistry is the study of the chemical reactions that take place inside organisms. It combines elements from both biology and chemistry. Biochemistry became a separate discipline in the early 20th Century. Biochemists study relatively large molecules like proteins, lipids, and carbohydrates, which are important in metabolism and other cellular activities; they also study molecules like enzymes and DNA. Biochemistry research has been done for around the past 400 years, although the term biochemistry itself was only coined in 1903 by the German chemist Carl Neuberg. The study of biochemistry essentially began with the invention of the microscope in 1665 by Robert Hooke. He was the first person to observe cells under a microscope, but they were dead cells; later on in 1674, Anton van Leeuwenhoek saw live plant cells under a microscope. Now that scientists had seen cells for the first time, they were eager to study them and discover more about the processes that occurred inside them. In the 18th Century, the French scientist Antoine Lavoisier proposed a reaction mechanism for photosynthesis, which is the process by which plants make their own food out of carbon dioxide, water, and sunlight, releasing oxygen in the process. He also was the first person to investigate the process of cell respiration, the process of making the energy molecule adenosine triphosphate (ATP) in the mitochondria of the cell. In the 20th Century, further advancements were made. Hans Krebs discovered the citric acid cycle (which would also become known as the Krebs cycle), a series of chemical reactions during cellular respiration where glucose and oxygen are converted to ATP, carbon dioxide, and water. Also, DNA became known as the genetic material of the cell and its structure was identified by James Watson and Francis Crick from previous research done by Rosalind Franklin. Presently, newer technology such as recombinant DNA, gene splicing, radioisotopic labelling, and electron microscopy are advancing scientific knowledge further than ever before. Topics in biochemistry research include enzyme mechanisms and kinetics, the making of proteins from DNA, RNA, and amino acids through the processes of transcription and translation, and the metabolic processes of cells. Biochemistry is closely related to molecular biology, which is the study of biological molecules such as DNA, proteins, and other macromolecules. Molecular biology techniques are often used to study biochemistry, along with techniques from other fields like immunology and physics. Since all life can be broken down into small molecules and chemical reactions, biochemistry is a broad science that is used in studying all types of biology, from botany to molecular genetics to pharmacology. Chemical reactions in cells are emphasized, but specific research topics can vary widely. For example, biochemists may be interested in researching the chemical reactions that occur in the brain (thereby connecting biochemistry with neurochemistry), how cells divide and differentiate, cell communication, the chemical basis of genetic inheritance, or how diseases such as cancer spread. 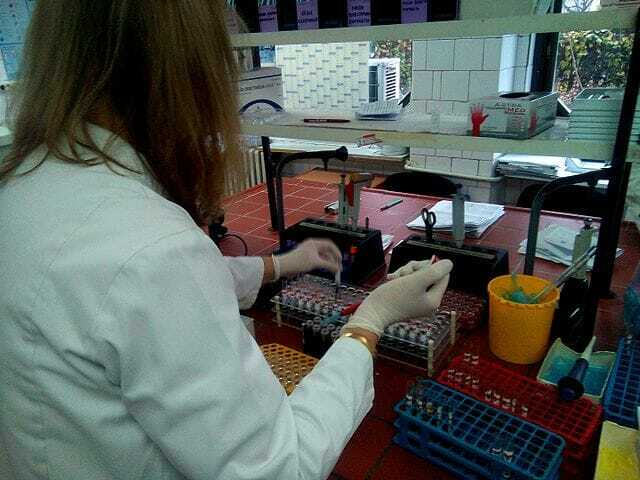 This is an image of a biochemist working in a laboratory. Biochemistry is a laboratory science. To work in the field of biochemistry, an individual must be interested in conducting research, and should obtain at least a bachelor’s degree. Many biochemists teach and are principal investigators of research laboratories at universities; these positions require PhDs. While most biochemists with PhDs conduct research, some are academic lecturers and solely teach at universities. However, these biochemists also had to do research throughout graduate school in order to complete their PhD thesis. Other biochemists are lab managers, which requires a master’s degree. With a bachelor’s degree, one may become a scientific research technician. The more education an individual has, generally the more independence they will have in a lab. Technicians carry out bench work and help perform experiments that a principal investigator designs. A lab manager has more responsibilities than a technician and may do independent research projects under the guidance of a principal investigator. Aside from academia, biochemists also work in industry positions. They may work in government laboratories or for a variety of companies including agricultural, pharmaceutical, public health, or biotechnology companies. Others provide specific services such as toxicology or forensics. In order to be a competent biochemist, one must be interested in biology or chemistry research and learn proper laboratory skills and safety procedures. It is also important to have an aptitude for mathematics and statistics, and be able to analyze the data generated from experiments. The ability to think outside the box and brainstorm new ideas is important for designing experiments. Biochemists must also keep up with the scientific literature by reading recent publications in scientific journals and attending conferences. Although it takes a lot of hard work, training, and study, biochemists are able to uncover new information about the chemistry of living things and contribute to advancing scientific knowledge. Students interested in becoming biochemists need to take many science courses during their time as an undergraduate. General knowledge of both biology and chemistry is essential. Many schools offer biochemistry as a specific major. It is also possible to become a biochemist after obtaining a biology or chemistry bachelor’s degree, but one needs to make sure that they have a good background in the subject they are not majoring in; i.e., an undergraduate majoring in biology needs to take chemistry courses (this is usually a requirement of all undergraduate biology majors), and an undergraduate majoring in chemistry should also take biology courses. Of course, there are also specifically biochemistry courses that students should take. Additionally, it is important to be well versed in mathematics and physics. As students advance in their undergraduate career, they will take more specific science courses based on their specific interests. For example, they could take classes in botany, molecular biology, biophysics, biomedical sciences, or structural biology (how molecules are organized into cells and tissues), depending on where their research interests lie. n.a. (n.d.) “Biochemistry.” Merriam-Webster. Retrieved 2017-04-25 from https://www.merriam-webster.com/dictionary/biochemistry. n.a. (n.d.) “Biochemistry Major.” MyMajors. Retrieved 2017-04-27 from https://www.mymajors.com/college-majors/biochemistry/. n.a. (n.d.) “History of Biology: Biochemistry.” BiologyReference.com. Retrieved 2017-04-26 from http://www.biologyreference.com/Gr-Hi/History-of-Biology-Biochemistry.html. n.a. (n.d.) “Molecular Biology.” The American Heritage® New Dictionary of Cultural Literacy, Third Edition. Retrieved 2017-04-26 from http://www.dictionary.com/browse/molecular-biology. n.a. (n.d.) “What is Biochemistry?” McGill University. Retrieved 2017-04-26 from https://www.mcgill.ca/biochemistry/about-us/information/biochemistry. n.a. (2017-08-04). “History of Biochemistry.” Bio Explorer. Retrieved 2017-04-26 from http://www.bioexplorer.net/history_of_biology/biochemistry/. AGCAS Editors. (2016-08). “Biochemistry”. Graduate Prospects Ltd. Retrieved 2017-04-27 from https://www.prospects.ac.uk/careers-advice/what-can-i-do-with-my-degree/biochemistry. Zeigler, Mary (Rev.). (n.d.). “Guide to Biochemistry Careers.” InnerBody.com. Retrieved 2017-04-27 from http://www.innerbody.com/careers-in-health/guide-to-biochemistry-careers.html.